The products may contain pieces of hard plastic. 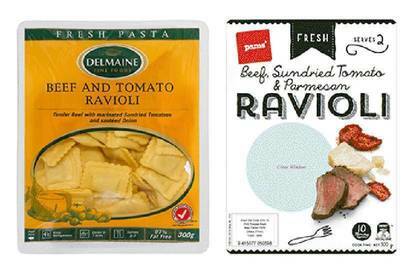 Delmaine Beef and Tomato Ravioli and Pams Beef Ravioli are being recalled because they may contain hard plastic. Both products were sold in 300g plastic packs in supermarkets and food retail outlets throughout New Zealand. The affected Delmaine Beef and Tomato Ravioli has “use by” dates 16/12/2015 and 24/12/2015. The Pams Beef Ravioli has “use by” date 02/12/2015. These dates are printed on the back of the packs. Do not consume the products. Customers with Delmaine products should return the ravioli to their retailer for a full refund and call 0800 335 642 with any questions. Customers with Pams products should call 0800 245 114 to arrange a full refund and ask any questions.